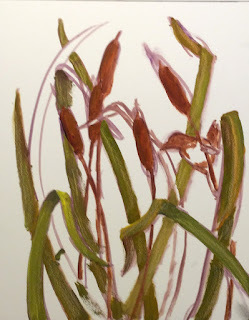 Diane's Art Stuff: Cattails and Marsh Wren. On to the next painting. In one of my watercolor classes, we painted cattails and a marsh wren. Here is the sketch and first steps. I am painting this on an 8"x10" Amperstand Gessobord with mostly Gamblin oil paints. I have drawn in the design with a mix of burnt sienna and purple thinned with Gamsol. Next I start blocking in the leaves of the cattails with ultramarine blue and cad yellow medium. Check back tomorrow for the next steps.